When I was 13 years old and I was just beginning to play drums at my church, I had no idea what it meant to serve. Our youth worship band was motley crew of young and fresh musicians that were brought together by our youth pastor and given a place to use and develop the gifts that God had given us! We had no idea what we were doing, but we were happy to be accepted and encouraged in our giftings! At 13 years old, I thought that it was my duty as a drummer to let everyone know how many notes I could fit within a 4 bar phrase (i’m pretty sure I didn’t even know what that was at the time) and how loud I could play all of those notes. I would try to play really “sick” beats and throw in these ridiculous fills every other measure just because I had practiced it earlier that week. This is the mistake that many drummers (and other instrumentalists) in church still make today. We disregard the ears that God gave us to listen to what the band as a whole sounds like and only focus on how good we can make ourselves look/sound. The goal should always be to make much of Jesus and less of yourself. That may mean writing a drum part that allows worshippers to focus on the lyrics instead of your beat. I believe the best way you can serve your church is to die to yourself and your own musical/social/political agenda. Learning how to follow the creative vision of your worship leader wherever he goes is of the utmost importance. When I think of serving I think of submitting. You must be willing to submit to your worship leader even when your most creative and amazing idea doesn’t line up with his creative vision for the song. You have to quit worrying about what all the other drummers in the room (on Sunday) will think about you if you play 4 on the floor, or if you play a simple 8th note build on the snare and floor tom. Perhaps you think that a simple drum part is a cop-out of truly being creative – but that may be the absolute best way to serve the song, and ultimately, the Church. 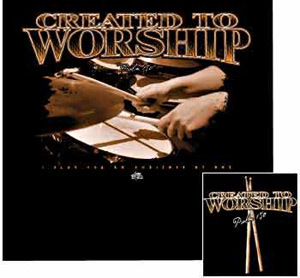 Think about it, if you’re writing songs for the Church you have to keep in mind that not every church has there own Neil Peart in the volunteer band, so you’re actually serving the Church by creating drum parts that almost any drummer can play. Seek to be the very best drummer that you can possibly be. This may seem like it conflicts with the above paragraph because you may never get to show your true skills behind the drum set at church, but being the best drummer you can be is more than being able to play the most intricate beat that showcases your 4-limb independence (although you should aspire to this). Being the best drummer you can be means that you show up to rehearsal 30 minutes early to set your drums up and go over any tuning and maintenance on your drums before the rest of the band shows up. Being the best drummer you can be means that you come to rehearsal prepared and know the songs well enough to explain the form to the rest of the band. Being the best drummer you can be means that you’re able to try different fills and beats on the fly if your worship leader doesn’t love something your doing. Being the best drummer you can be means that you put your worship leader at ease and allow him to focus on leading worship. Being the best drummer you can be means that you’re able to subdue your overwhelming desire to add a double bass on the chorus. Pray for your worship leader. Pray that God would continually mold him into the kind of leader that God wants to use. Pray that God would bless his children and his marriage as he leads them day in and day out. Pray that God would give him vision for your worship team. Pray that God would persevere him in the faith as you fight the good fight alongside each other for years to come. IN FACT, TAKE A MOMENT RIGHT NOW AND PRAY THESE THINGS FOR YOUR WORSHIP LEADER. « An article about LAMP and their aviation ministry in western Canada.